Thanks, Brian! 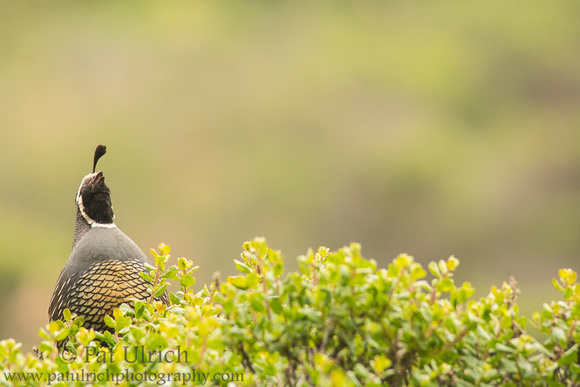 Quail are one of my favorite subjects, and catching one mid-song had been high on my wishlist for years before I came across this happy bird. This is one beautiful bird and a very nice snap. Thanks very much! They are a gorgeous bird with a lot of personality. They're found in all of the western states, but not east of the Rockies. Though according to the comment below from Mick, you can also see them in New Zealand! Great photo and a beautiful bird.I remember seeing them many years ago in New Zealand there they were introduced and became naturalized. Thanks, Mick! That's really fascinating about them becoming naturalized in NZ. Add that to my list of reasons that I must get down to that side of the globe for some photography! Cute bird and a great photo! Thanks, Eileen! They are one of my favorites to watch! I wonder if that topknot thingy serves any functional purpose? Hope you'll swing on by http://image-in-ing.blogspot.com/2015/08/double-play-on-way.html to check out some other great photos & feel free to link up! He is perched so perfectly in the greenery. Nice photos. It's funny, but I never thought of quail as a bird that "sings" - glad to see this informative shot. Thanks! I suppose its more of a "call" than a "song", but it's one of my favorite bird sounds to hear!